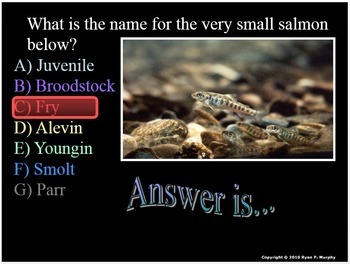 his is a 145 slide PowerPoint Review Game about Salmon, Fish, Rivers, Lakes, and Water Quality Topics. This Review Game is one small part of my Rivers, Lakes, Fish, and Water Quality Unit that I offer on TpT. Also included are hundred of unit PowerPoint slides, the bundled homework package, lesson notes, and much more. I don't play this game like Jeop_ _ _ _, instead, students record the answers 1-25 as they work in small table groups. Each question 1-20 is worth 5 pts while 20-25 are all bonus questions worth 1 pt each. The bonus round for this game has to do movies that have aquatic parts to them. The final question is a 5 point wager question. 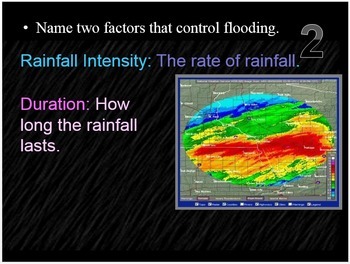 The answers are provided after the review in PowerPoint form so the students can self assess. The questions are previewed one last time before the answers are revealed so the teacher can call upon table groups or individual students for the answer. Also included are many freebies / sample PowerPoints from the unit described below. 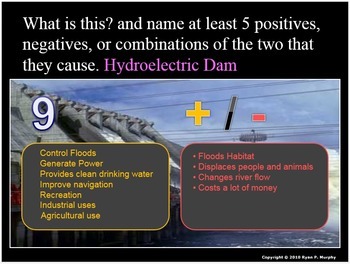 Please visit my other posting on TpT called the Rivers, Lakes, and Water Quality Unit which includes this PowerPoint within the four part 2150+ slide PowerPoint roadmap, 10 page bundled homework / assessment, 7 page modified assessment, detailed answer keys, and 13 pages of unit notes for students who may require assistance that chronologically follow the PowerPoint slideshow. The answer keys and unit notes are great for support professionals. This larger file also includes 25.flv video links, lab handouts, activity sheets, rubrics, materials list, templates, guides, and much more. Also included is a 190 slide first day of school PowerPoint presentation. Everything arrives in editable format and can be modified to fit any curriculum or time requirement. 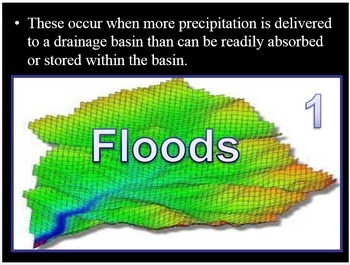 Areas of Focus within The Rivers and Water Quality Unit: Watersheds, Rivers of the United States, Sections of a River, Parts of River (Vocabulary), Stream Order, Erosion and Deposition, Water Quality, Chemical Properties of Water, Bio-Indicators of Water Quality (EPT richness), Physical Properties of Water Quality, Rivers and Flooding, Factors that Control Flooding, Types of Flooding,Tsunami's, Wetlands, Flood Prevention, Levees, Dams and Ecosystem, Importance of Dams, Impacts of Dams, Hydropower, Parts of Dam, Salmon (Life Cycle), Systems of Help Salmon, Fish (General), Layering in a Lake, Lake Turnover, Nutrients and Lakes. I also sell all 20 Science Units as a discounted curriculum bundle. This includes all 20 units (50,000+ slides), in Life, Earth, and Physical Science for students in grades 5-10, This also includes 300+ pages of bundled homework / assessment that chronologically follows each unit, 200+ pages of modified assessments, 325+ pages of answer keys, 260 pages of unit notes, 40+ PowerPoint review games (5000+ slides), hundreds of lab activities with questions and answers, hundreds of project ideas, 315 videos, hundreds of pages of handouts, First Day PowerPoint, Guidebook, and Four Year Curriculum Guide and classroom license.